One of the most delightful taste experiences that greet the arrival of Spring in many states in the US is that of the sweet, plump and juicy strawberry. If you are lucky enough to live in California, you don’t have to wait for Spring or Summer to enjoy this delicious fruit. Strawberry Season lasts all year in California. Starting with the San Diego area in Southern California and going up the coast to the Monterey area, just short of San Francisco, there are strawberries of one kind or another growing all year round. 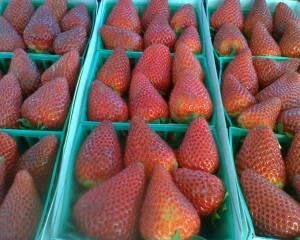 Along the 101 Freeway in Oxnard the strawberries are ripe starting in January. By July the fields have been torn up and in late August the new crop is planted. As you go further up the coast, different types of strawberries are available throughout the year. 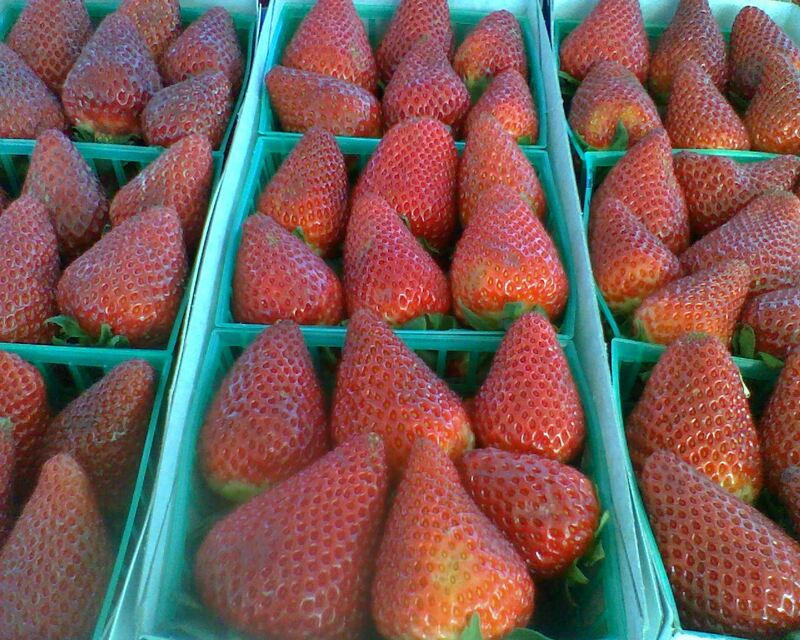 In fact, in Oxnard, there are different types of strawberries growing all year round and there is almost always, a truck parked on a corner selling fresh strawberries. The area near Monterey produces the largest amount of strawberries with Oxnard following close behind. There was a time when the San Fernanado Valley produced a fair amount of berries, but unfortunately those days are gone. Most of the cultivated land that used to exist in this area is now covered with buildings and/or concrete. Strawberries are picked by hand and are almost always picked when ripe or almost ripe. The strawberry is a fragile fruit and should be handled carefully. If they are not going to be used immediately, they should be stored in the refrigerator. But even in the refrigerator most types of strawberries will not last more than a day or two. However, contray to the previous sentence, there are some types that will last longer. There are many varieties of strawberries available. One of the largest berries is the Gaviota, but large does not necessarily mean that the fruit will be sweet or sweet enough to suit your tastes. The best way to purchase strawberries is either directly from the grower, a farmer’s market or a truck parked on the corner. These vendors will almost always allow you to taste their wares before you purchase them letting you see if that is the fruit that you want to buy. Not only are strawberries sweet and delicious, but they are also a healthy fruit that is low in calories. One cup of strawberries contains only 45 calories and they are high in Vitamin A as well as other vitamins and minerals. To clean strawberries, just wipe them with a damp paper towel. If you do feel that you have to wash them, place them in a colander and gently spray them will cool water and dry with a paper towel. Wash or clean them only as you need them because washing them will hasten the deterioration of the fruit. To remove the stems and leaves (hull) simply twist and pull or you can use the tip of a paring knife. There are also tools made to help you remove the hulls, but I think it is easiest just to use the paring knife. Strawberries are good just to eat out of hand or they can be used in a multitude of dishes. Try them on your cereal or with cream or sour cream. They can be used in pastries, pies, ice cream, milkshakes, jams, jellies and syrups. Of course, one of the favorite ways to prepare strawberries is strawberry shortcake. They are also good on waffles[/amazon], pancakes or inside crepes which are a very thin pancake that can be rolled or folded. Nordic Ware has a pan that creates waffled pancakes; by using this pan, you do not have to decide between having waffles or pancakes. You get to have both in one fell swoop. Try some of the recipes that interest you in our recipe section and then create your own.